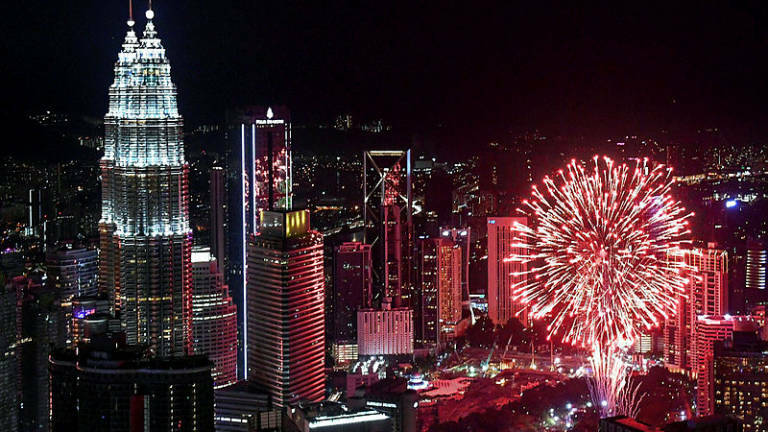 01 Jan 2019 / 08:07 H.
KUALA LUMPUR: At the stroke of midnight, colourful fireworks donned the skies across the country, marking the start of the year 2019. Although 2018 left behind many bittersweet memories, the arrival of the new year was celebrated with full of festivity through various events held nationwide. 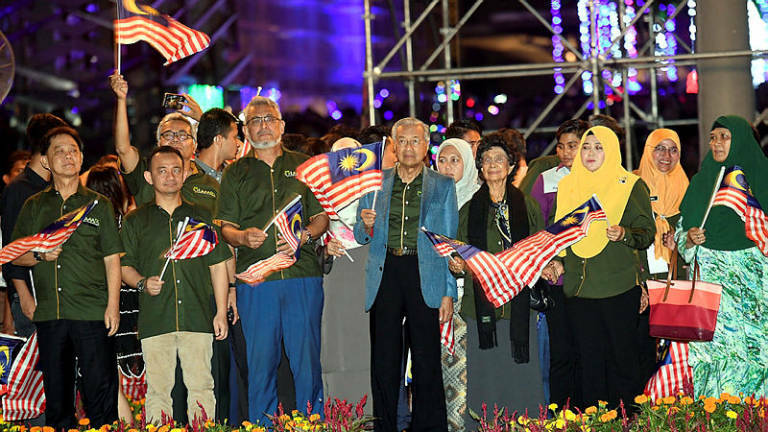 In PUTRAJAYA, Prime Minister Tun Dr Mahathir Mohamad along with thousands of Malaysians from all walks of life ushered in the new year at the Federal Government’s administrative capital with spectacular light technology displays, as well as traditional and digital fireworks. The colourful new year celebration was held in conjunction with the 2018 Putrajaya Light and Motion Festival (Lampu 2018) at the Putrajaya Square, here. Mahathir and his wife, Tun Dr Siti Hasmah Mohamad Ali, arrived at 11pm, and were greeted by Federal Territories Minister Khalid Abdul Samad. As soon as they arrived, Mahathir and Siti Hasmah witnessed Lampu’s signature grand projection mapping show on the facade of the Palace of Justice. After the stroke of midnight, Mahathir and the visitors watched fireworks and digital fireworks shows which lasted for six minutes, followed by the singing of the Negaraku. In his short speech before the new year, Mahathir called on Malaysians to work harder so that the country could become a developed nation by the year 2025. “This is our goal. All parties need to create a peaceful environment and equally develop our country, “ he said. Mahathir said he was confident the new year would bring blessings for all Malaysians. “I am confident we will all work together to develop this blessed state. This is our country and it is up to all of us to shape it,“ he said. Meanwhile, the rainy weather in the capital did not stop people from filling up the Sunway Velocity shopping mall to welcome the new year with performances from well-known local artistes. The shopping mall also extended its operations up to 12 midnight to enable visitors to enjoy shopping activities amid the chance to capture precious memories at the photo booths provided as well as enjoy meals from over 40 food trucks. The P. Ramlee Arts and Heritage Enthusiasts Association (Perwalee) took the initiative to organise a silat demonstration performance at Kompleks Muhibbah, Ampang Jaya in an effort to preserve the heritage art. 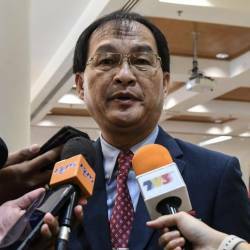 In PERAK, the state government organised its new year’s celebration at the Universiti Pendidikan Sultan Idris in Tanjung Malim in an effort to reach out to the people. Rain which had poured since 8pm did not dampen the spirit of approximately 5,000 people from attending the event officiated by State Youth and Sports Development Committee chairman Howard Lee Chuan How on behalf of Mentri Besar Datuk Seri Ahmad Faizal Azumu. In KELANTAN, the celebration at the Kota Baru City Council Square was a little different when it involved poem recital and cycling events. Hundreds of cyclists participated in the cycling event around the city which kicked off at 8pm, covering a distance of 30km. In SARAWAK, heavy downpour which began at 7.40pm did not dampen the spirit of local residents and tourists alike to flock to Kuching Waterfront to usher in the new year and witness the launch of Visit Sarawak Campaign by Chief Minister Datuk Patinggi Abang Johari Tun Openg. In SABAH, some 1,000 local residents attended the Gagar 2019 #kasijadi programme organised by Sabah FM in conjunction with the 2019 New Year’s celebration at Dataran Waterfront Segama, Kota Kinabalu. More than 2,000 others flocked the Pasir Putih beach in Sandakan to enliven the celebration, which was also attended by Minister in the Prime Minister’s Department Datuk Liew Vui Keong. In SELANGOR, the celebration in Shah Alam was filled by zikir and prayers led by famous preacher Al-Habib Ali Zaenal Abidin Al-Hamid. The Selangor Berselawat 2019 programme was also attended by Mentri Besar Amirudin Shari. In NEGRI SEMBILAN, the 2019 New Year Carnival in Nilai was enlivened by the participation of almost 8,000 people from all walks of life. They were also entertained by singers Ara Johari, Syamel and Datuk Hattan. In JOHOR, the new year brought joy to motorists using the Malaysia-Singapore Second Link (Linkedua) expressway, especially Johor Baru residents who work in Singapore, following the abolition of the toll collection at the Tanjung Kupang Toll Plaza. Deputy Works Minister Mohd Anuar Mohd Tahir officiated the toll abolition in a ceremony held at the toll plaza in Gelang Patah, tonight. 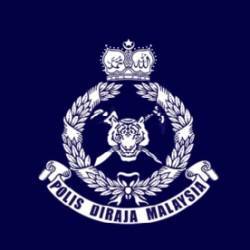 In TERENGGANU, the new year’s celebration held at the Gong Badak Indoor Stadium took place in a moderate mood with some 3,000 people gathered at the event featuring religious, spiritual and Islamic-based entertainment programmes which began at 5pm. During the celebration, Mentri Besar Dr Ahmad Samsuri Mokhtar also launched Friday as a day of knowledge and Saturday as family day in the state. In George Town, PENANG more than 1,000 revellers ushered the new year in style, with the auspicious event taking 816-feet above sea level, at Penang’s highest iconic entertainment tower, The TOP Penang. 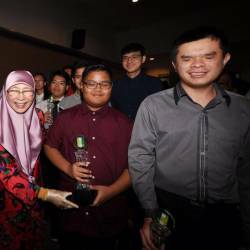 Chief Minister Chow Kon Yeow arrived at 11.10pm together with the founder and chief executive officer of Only World Group Holdings Berhad Tan Sri Richard Koh and the group’s co-founder and chief operating officer Puan Sri Jean Koh as well as several other state executive councillors.